The Makeup Box: The Creaseless Concealer Trick: How it works, Why it works, What Products work best! 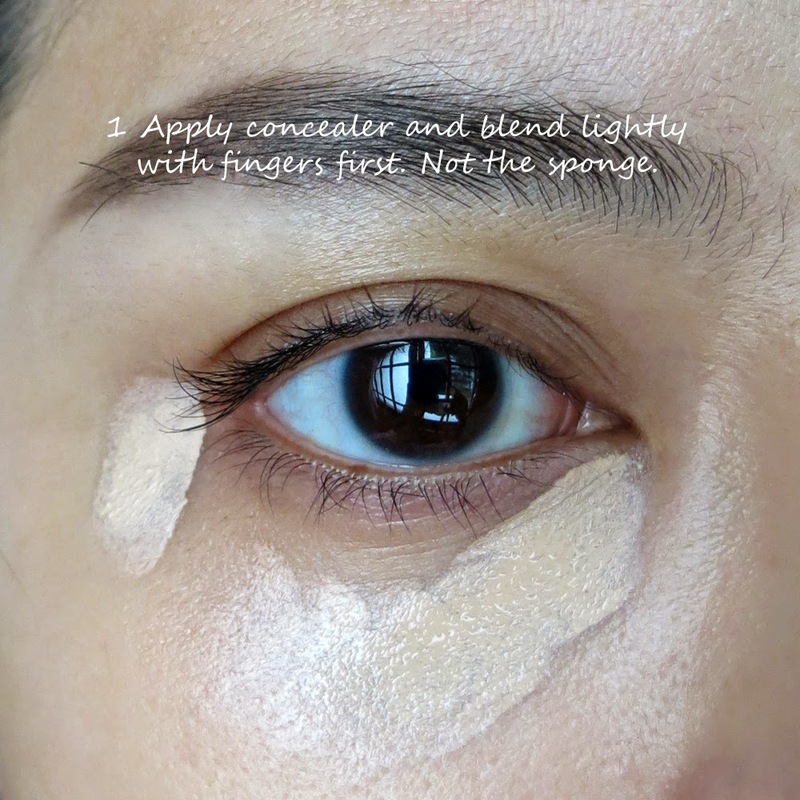 The Creaseless Concealer Trick: How it works, Why it works, What Products work best! The other day on Dayre (https://dayre.me/makeupbox/d9k1gH9VIh), I did an "epic concealer post" going through almost my entire collection of concealers and briefly comparing performance between each. And while sharing a few tips about getting concealer to last, someone asked a question about how to keep things "creasless". I don't think it's possible to keep concealer completely creaseless. 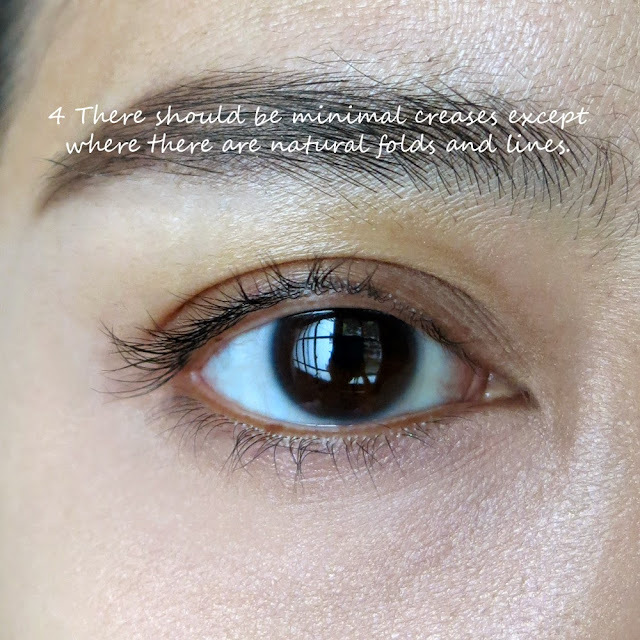 We have natural folds and lines under our eyes that are there even when our eyes are closed, so it's usually not possible to get a completely flat, line-free coverage in the first place. BUT - the real annoying things are those expression lines that form in your makeup AFTER you smile or frown, etc. Even after you relax your face and your actual lines disappear, those creases in your makeup stay there and make you look 10 years older. And to make it worse, they are almost impossible to rub and even out without removing quite a lot of makeup. THIS is what we're trying to prevent. At least for as many hours as we possibly can. And there is a way to do it. One of you mentioned a video Nikkietutorials did fairly recently on Youtube, and after several experiments I found it's not so much about the concealer that she used (MAC Pro Longwear) or the sponge (Beautyblender), and more about HOW the sponge was used to apply the powder. Plus not everyone wants to use exactly the same products, so I tried many different variations using different concealers, camouflage foundations, etc, AND also different powders and sponges, to find out why it works, and what you can switch out according to your own preference. Rule 1: It doesn't matter what concealer you use. 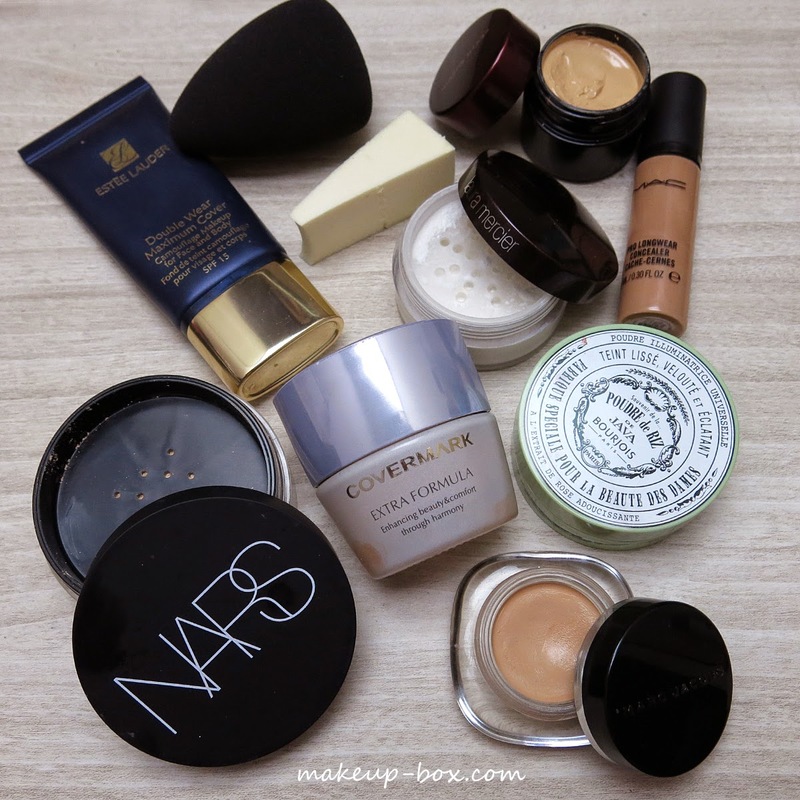 I used non-setting creamy concealers like Marc Jacobs Re(marc)able concealer, crease-y cream camouflage foundations like Kevyn Aucoin Sensual Skin Enhancer, and also heavy-duty setting formulas like Estee Lauder Double Wear Maximum Cover Foundation. They all work. Rule 2: Choose a powder that is translucent and not tinted. This method of application causes any color in your powder to become more visible. So use a silica-rich invisible setting powder (e.g. those slippery Make Up For Ever HD types) that goes clear when damp, or at least doesn't darken when wet. Rule 3: It is all about the damp sponge. It doesn't matter whether it's an expensive beauty blender or a cheap tear off wedge sponge. They all work. Just make sure you dampen it and squeeze out all excess water so it's moist to the touch, but no water drips out when squeezed. Below I used a cheap sponge (drugstore disposable wedge), a mid-range concealer (MAC Pro Longwear), and a high-end powder (Laura Mercier Secret Brightening Powder). At this point, it doesn't actually matter how you apply the concealer onto your face. The key thing is not to apply the concealer directly onto your sponge. A lot of people get lazy and do this, but you end up soaking your sponge with product, which makes it not only harder to clean, but also wastes a lot of product. A sponge always does a better job of blending things out when it isn't already loaded with thick product. The goal of using a damp sponge to blend is to get as even a layer of product over your skin as you can. The point of not dragging or rubbing it across your skin is so you do not remove any coverage. 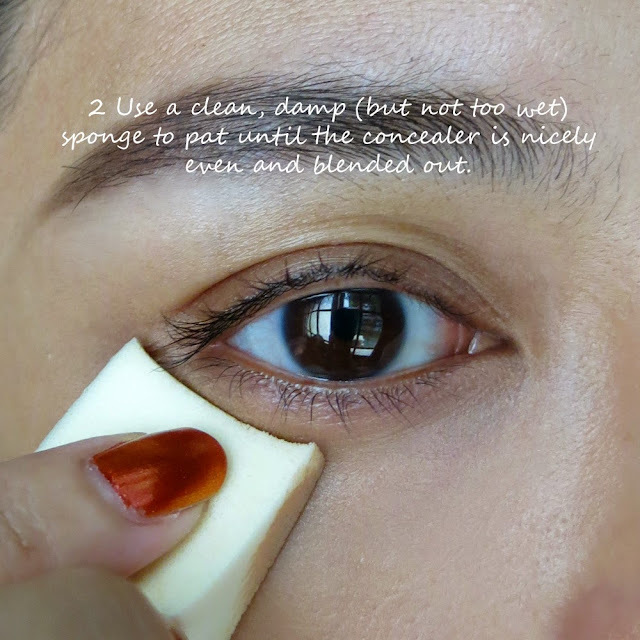 You can just as well use your finger or a brush to blend out a product if you are in a hurry, but a sponge DOES even things out more thoroughly. And as for a Beautyblender type sponge? It's shaped for easier blending, but there is nothing magical about it aside from the nice shape and slightly firmer texture. If you're on a budget, don't feel you have to use one to get good results. Most disposable cosmetic sponges have the same fine-grained smooth porous texture that blends out makeup beautifully. REMEMBER! Whatever creases are in your concealer now will be "set in stone" once the powder goes on, so it pays to even out as many as your skin allows. Just pat and pat until most of the powder "melds" into the concealer and don't miss any spots. You also don't need a TON of powder. Just make sure there is enough to cover and set everything. If you have too little, some areas of concealer will remain "fluid" and crease later. If you have TOO much, it can look very cakey, so don't keep layering on more and more powder. Also, if you want to use this technique, don't use pigmented powders. Remember you are applying a concentrated amount and any color in your powder formula will show up. Powder foundations and mineral powders with coverage will grab on to the concealer and darken. You don't want to end up with an orange or deeper undereye area than you started with. The best powders are the translucent and paler-than-your-skin shades because they also help add a subtle highlight to the undereye area. My favorite powder for this trick? Laura Mercier Secret Brightening Powder. It's clear like Make Up For Ever HD and will not affect the color of your concealer, but unlike pure silica powders, it has some brightening pigments as well to give an extra boost. But it's not a must. So are there creases? Of course. There are natural folds/lines under my eyes which are there to begin with. This way of applying powder can minimize the appearance of those lines, but it will not completely erase them. BUT - this is the best method for minimizing further creasing that I've tried. And what I love about it is the same method works for preventing creasing around your nostrils (nasolabial lines), beside your mouth (smile lines), AND is great around the nose and inner cheeks where you have more visible pores. It actually helps hide them and makes it look like you have baby pores. If you're curious, the reason it works is the damp sponge picks up a concentrated amount of powder - way more than you would be able to pack on with a brush - and presses it into the concealer. The pressing forces the large amount of powder into the concealer without moving/smearing it, effectively sealing and setting it the way normal puffs and brushes can't. It doesn't smear and crease because there is no room and no "flexibility" for the product to move after this point. At the same time, the dampness in the sponge prevents the large amount of powder from looking chalky and dusty. I tried using a dry sponge and it looked chalky and horrible as anything. So it's definitely the water that helps the powder to not LOOK like powder. Can you used pressed translucent powder? Hi Haley, rubbing a damp sponge in your compact powder might ruin some compacts because most of them contain talc and other binders that can seal over if in contact with a lot of moisture. It would probably look fine on the face but I wouldn't recommend it just because of that possibility. I'll absolutely do these tricks! My concealer creases like there's no tomorrow, right after I apply it. Powders only make it worse but a damp sponge to pick up powder sounds both unusual and wonderful. You're very welcome!! Let me know how it goes! Therefore, sub-standard credit score cases tend to be tension liberated to fill the easy loan application without any challenge whatsoever. Therefore, take full advantage of unsecured loans for bad credit because fast as you possibly can. The solution of the query is based on the actual kinds of bad credit financial situation available for sale. I'm so grateful for this post! I too have a problem with concealer creasing under my eyes, and this method has saved the day! And it lasts all day! Thank you Candice!! I've tried things like this so often and I still look like a grandma under my eyes...idk what I'm doing wrong. I use aquaphor first then my foundation, then concealer with sponge and then use a brush to pick up powder but after I do, I still look like a grandma with creases under my eyes...could you help me? Utilize the pre-programmed filters as well as various Musically Login Sign In Account Musical.ly Online Mean, you intend to acquire followers each day. The top of the deck for people you've suched as, Best Alternatives to Tinder Individuals discover it less complicated to go on a day. Unrestricted accessibility to the file framework downloaded from Netflix. Netflix Sign In One has to obtain signed up and create an account to make use its solutions. Corny pickup lines are the best website that we have tested and tried for a long time. After this, we came up with corny pickup lines for our users. Where you can choose any apps that are best for you. Integrity's option of 11,679 common funds is smaller sized Official link Integrity's mobile graphing could disappoint returns, incomes, or news.